“Let’s go to Oregon again,” I randomly suggested one day after Thanksgiving. And so, the day after Christmas, we drove back to San Francisco from Los Angeles after spending the holiday with friends and family from back home. We made it back early enough and spent the remainder of the day unpacking and packing for Bend. As with any of our road trips, we woke up at the crack of dawn. The drive started in San Francisco at 5:30am, and we made it to Bend at around 3:00pm. It roughly took 8 to 9 hours with over 500 miles in the course of one day. We mainly took the I-5 N and US-97 N since it was the fastest route. 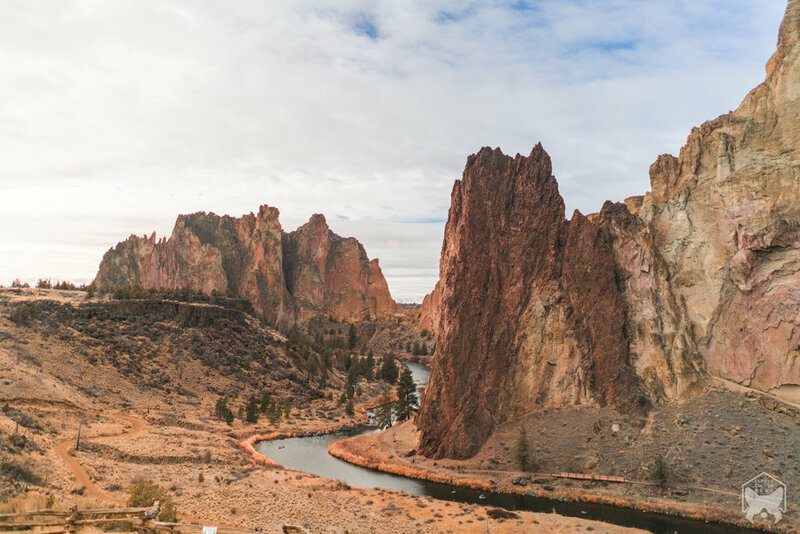 The road-trip to Oregon has always been a treasure for the eyes with its scenic highways and beautiful views of the Cascade; US-97 N was enchanting during the winter. For the most part, the drive was peacefully smooth without a lot of traffic. My 2014 Prius was doing its best and trucking along; you know for sure we’re from California with this car. If you are driving into Oregon during the winter with a two-wheel drive (2WD), I recommend getting snow-chains at an AutoZone. Always check the weather and driving condition prior to any trip. Make sure you have chains when it’s the winter season, just in case. Also, all AutoZones will accept refunds on snow-chain if you don’t end up using them. Better safe than sorry. 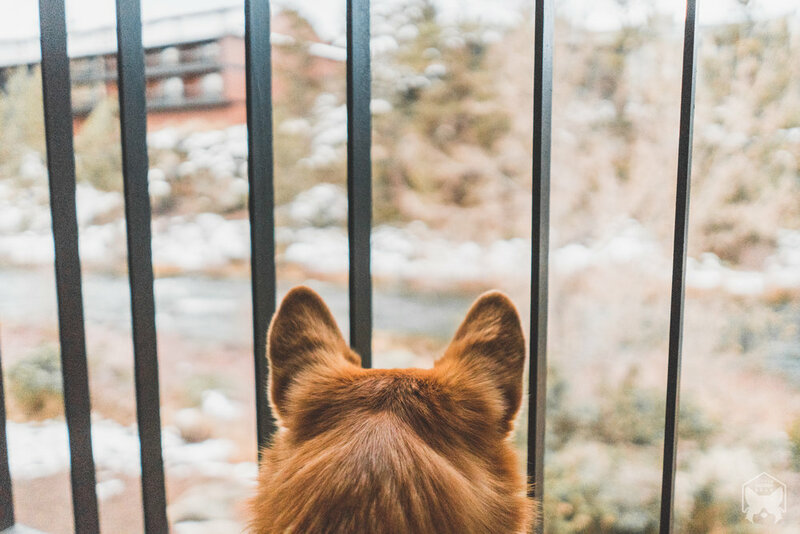 During our time in Bend, we stayed at the lovely and dog-friendly Riverhouse on the Deschutes. Check-in was quick and smooth, and they gave us complimentary dogs treats along with the essentials like dog food and water bowls. Cooper got a green squeaky toy from them as well (he made sure we brought it back to SF). Our room was on the 2nd floor, and it came with a large balcony, where we got a gorgeous view of the Deschutes River. 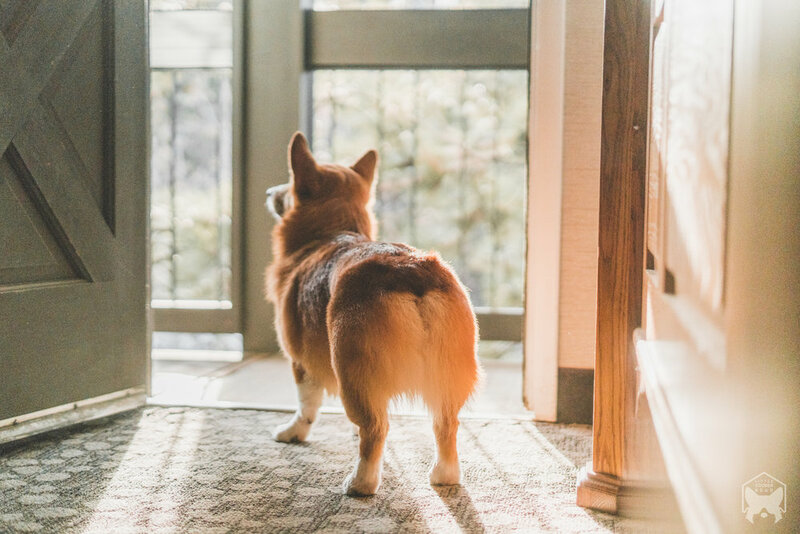 Both Cooper and Sachi took an immediate liking to their new home, and the balcony was the first thing that got them snooping and sniffing. Below us and along the banks of the river, there is a dog area station which was perfect for morning and evening potty sessions. After unloading all our bags and belongings, we took the pups to Robert Sawyer Park which was a 10-minute walk from Riverhouse. The sun was just starting to set when we made it to the park. The sky was a nice blend of warm pink and blue pastel colors while the clouds looked like cotton candy. The park was blanketed in a fresh sheet of snow from the previous snowfall. 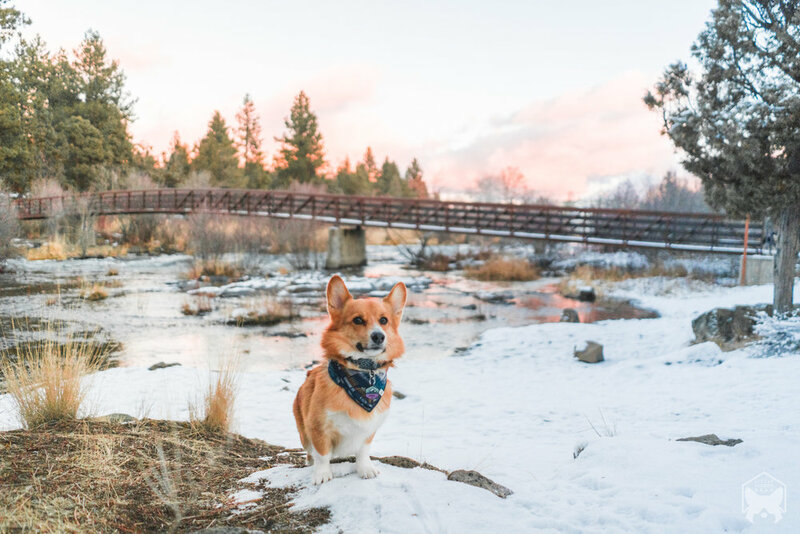 Sawyer Park offered plenty of trails that are dog-friendly, and we got to enjoy watching the Deschutes River pass through. There are reedy marshes that attract a ton of geese and ducks. We glimpsed at the sunset on the footbridge that connected the two sides of the river. This was such a beautiful park and made for a nice escape into nature. 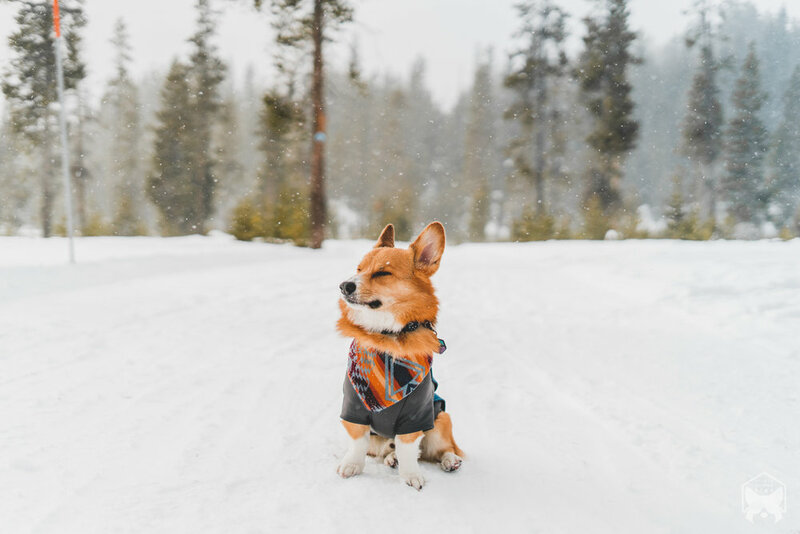 Cooper was a fan of this place and was happily romping around in the snow. He almost went for a swim in the river, but luckily, I stopped him in time. I wish every park back home was like Sawyer Park. Once the sun finally set, we walked back to the hotel and readied ourselves for dinner at Bangers and Brews. This restaurant is family-owned and serves a variety of sausages, including lamb, wild boar, water buffalo, duck and bacon, and even elk! We ordered the chili cheese fries as an appetizer to go with the local beers on tap. As for the sausages, we went with wild boar and elk. Their homemade chimichurri sauce was phenomenal. This local eatery was a great place to hang out for the evening, and we were able to enjoy it with our dogs as well! There are outdoor seatings with heaters. There are no better alarm clocks than a couple of pups who needed their morning potty session followed by breakfast. After getting some much-needed beauty-rest and getting an 8:00am wake-up call, everyone was up and ready for a full day of adventures. For the humans’ breakfast, we headed over to The Sparrow Bakery and ordered their famous breakfast sandwich and ocean roll, along with a cup of warm coffee (dark roast, black). While the bakery itself isn’t dog-friendly, the outdoor area and the workshop that’s right next door are. You can order your food at the bakery and pop over to the workshop with your pups while you wait. The friendly staff at the bakery would bring the food over to you if you chose to sit in the workshop. The food at The Sparrow Bakery was absolutely delicious; the breakfast sandwich had definitely won over my taste buds. Once we were done with breakfast, we ventured slightly up north to Smith Rock State Park. This state park looked like a mini Zion National Park, except Smith Rock was more dog-friendly! We were able to enjoy the scenic views of the deep river canyons from above and down below. We saw a few people climbing the base of the canyons here; Smith Rock is well known for rock climbing. 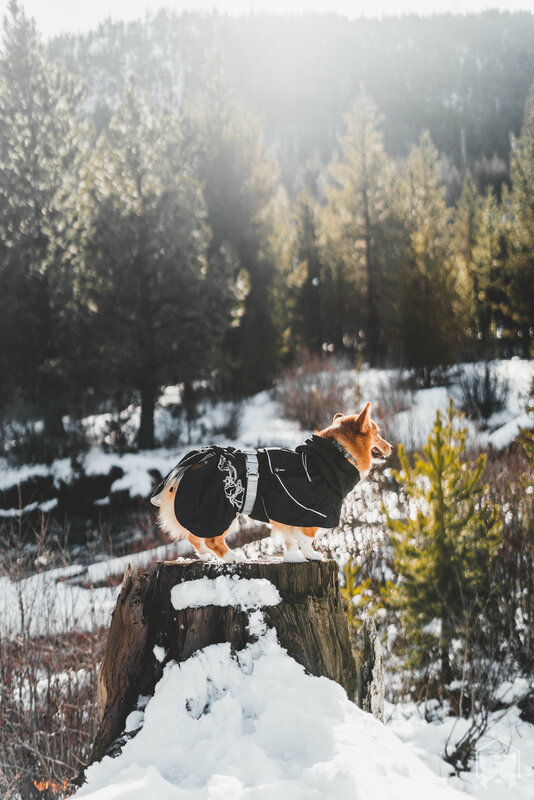 There are miles of hiking trails, and all of them are accessible to humans and canine, but do keep your four-legged friend on a leash since there are some sensitive habitats within the state park. We followed one of the trails along the river for about 4 miles (roundtrip), and once we had fully absorbed the nature around us, it was time to head back to the car for our next destination. About 12 miles away from the Smith Rock State Park lies Steelhead Falls. The trail was 2 miles (roundtrip) to and from the waterfalls. If you’re looking for a nice and quiet scenic stroll in the woods, this is the trail for you to enjoy with your pups. From what we’ve heard, people come here for fly fishing. A small note about this trail is that the ground can get soft from the rain and snow, so be careful of your footing. After spending a good chunk of our day in the outdoors, we moseyed our happy selves back to Bend. When we arrived in downtown, it started to snow! Good thing I brought my gloves and scarf with me. One of the places we wanted to check out was Bend’s local dog store, Bendy Dog. Unfortunately for us, it was bad timing since the dog store was in the process of moving location (just next door) and was closed until mid-January. Although we were bummed at first, the downtown trip was made up when we walked around and window shopped at all the local dog-friendly stores. Cooper and Sachi were happily greeted by all the other shops; and obviously, Cooper had to work his charm at every shop keeper for treats. Since we were already downtown, we grabbed dinner over at Zydeco Kitchen & Cocktails, known for its Cajun-influenced American cuisine. It was certainly a delicious meal and was fancier than we expected. I loved that this restaurant offers free homemade dog biscuits to take home; they gave us four biscuits, which Cooper and Sachi gobbled right up when we gave it to them. Once dinner was over, we called it a day and headed back at Riverhouse where everyone knocked out. On this day, I was looking forward to our hike to Tumalo Falls when I woke up from a good slumber. But first things first, breakfast! We ended up at The Sparrow Bakery again for coffee and baked goods; I ordered the breakfast sandwich again. It is that good. The road to Tumalo Falls was simply enchanting. It didn’t take us long to get there since it was only 17 miles away from our hotel. The trail was covered in snow, but it was packed enough that we didn’t need snowshoes. We began our hike along the river that would guide us to Tumalo Falls. I would rate this trail as easy since there weren’t any switchbacks, steep inclines, and loose gravel, or slippery slopes. I barely broke a sweat. Cooper and Sachi both enjoyed the trail a lot. It was wide and open but the best part of it all was the snow. The trail had a quite the number of people (most were families) but it didn’t feel crowded at all. There were plenty of moments where I felt like it was just us hiking, two humans and two dogs. As we were getting closer to Tumalo Falls, the sound of water crashing onto rocks was getting louder. We were able to see Tumalo Falls from a distance when we came across a bridge and campground. To see more of Tumalo Falls, there were two viewpoints: one at the bottom from afar and one at the top where you would need to work your glutes. This waterfall was much more impressive than the one we previously saw. At the first viewpoint, closer to the campground. The second viewpoint which is at the top. Keep in mind, we did this hike during winter with plenty of snow on the trail and road. Apparently, you can drive to the falls during the spring and summer since the road would be clear enough for cars to go through. 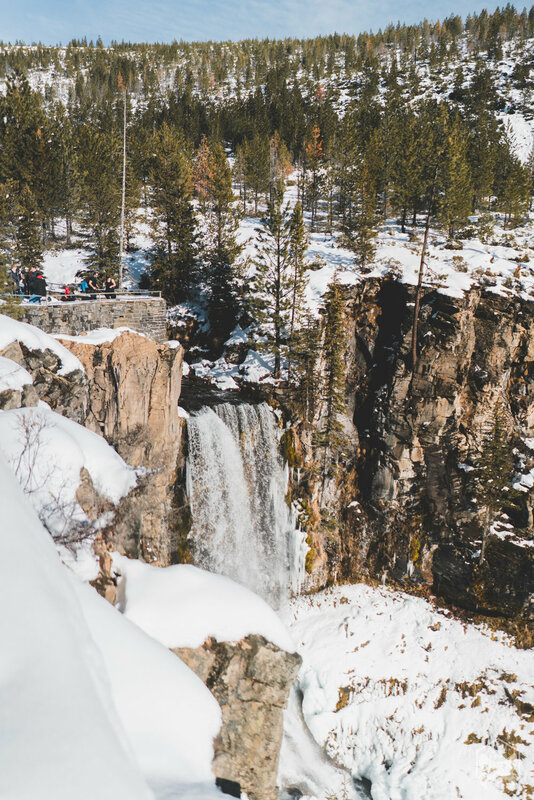 Depending on what time of the year you go to Bend, make sure you check the road condition for Tumalo Falls. We did roughly 8 to 9 miles, and it was certainly a day well spent. Both Cooper and Sachi were exhausted by the end of the day. They immediately knocked out when we got back to Riverhouse. Cooper slept soundly on one of the beds and Sachi found a cozy nook in the closet. When dinner time rolled around, we headed over to Spork with the pups. They have an outdoor area with heaters. The weather was clear so we were able to enjoy dinner outside with the pups next to us. Spork offers Asian-Mexican fusion cuisine that was absolutely divine for the taste buds. We ordered the most popular dishes along with some from the special menu that day. Highly recommend this place if you’re looking to satisfy your Asian-Mexican cravings while having a dog by your side. Dog-Parenting Tip: After a long day out in the snow, I made sure to treat Cooper and Sachi’s rough paws with paw creams. This will help prevent their paw pads from cracking by keeping it moisturize after a long day of outdoor play. The two paw creams that I currently carry with me are from Lightning Soft Paw and Happy Pet Brand. 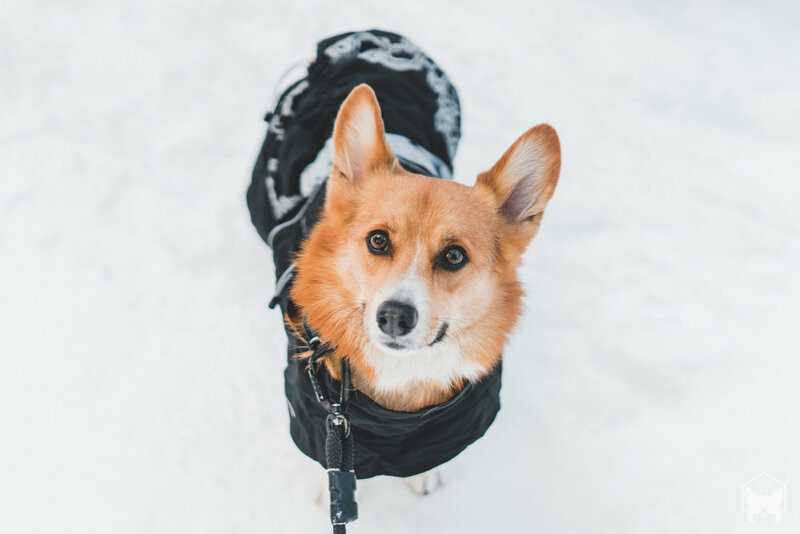 As an added protection, prior to outdoor activities in hot or cold weather, apply paw wax like the Lightning Soft Paw Shield or Musher’s Secret. Watching the Deschutes River from Riverhouse hotel room. It was our last full day in Bend with initial plans to hike to Dillon and Benham Falls. We were up early again and got coffee over at Thump Cafe before making our way towards Mt. Bachelor. The drive to Dillon Falls to Benham Falls trailhead came to an abrupt end when my Prius got stuck on an icy road. Luckily I had chains in the car to get us out of this slippery situation. It’s good to be prepared! It took about 20 to 30 minutes to get my car off the icy road. After this ordeal, we decided to just spend the afternoon at a sno-park near Mt. Bachelor where the road was not icy and evenly plowed. No more chasing waterfalls for us. 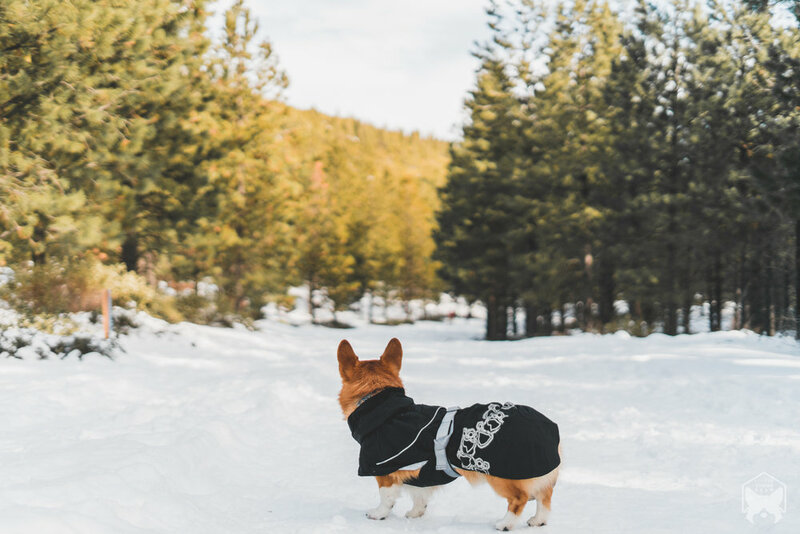 If you’re looking to spend a leisure day in the snow with 250 something-miles of motorized and non-motorized dog-friendly trails, then just head over to Wanoga Snow Play Area Sno-Park. 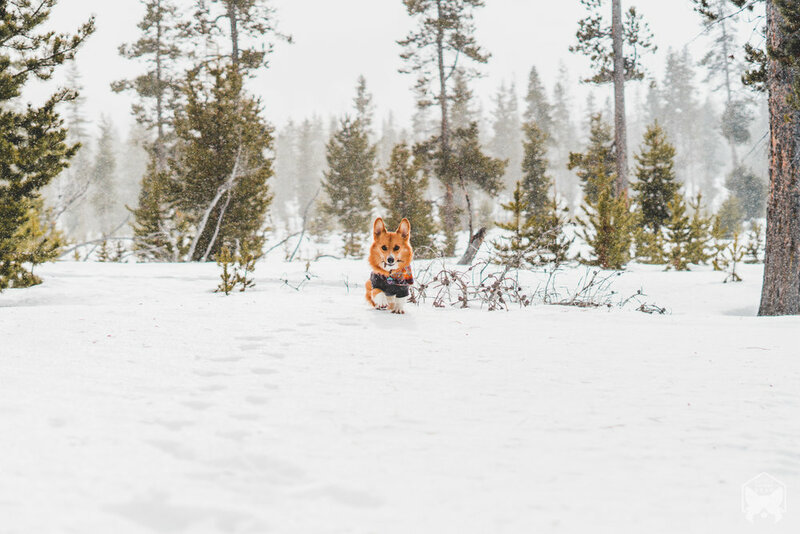 We had asked a few locals about dog-friendly sno-park near Mt. Bachelor and everyone pointed us to Wanoga. The other sno-parks didn’t allow dogs to be off-leash, and our dogs were itching to run around. 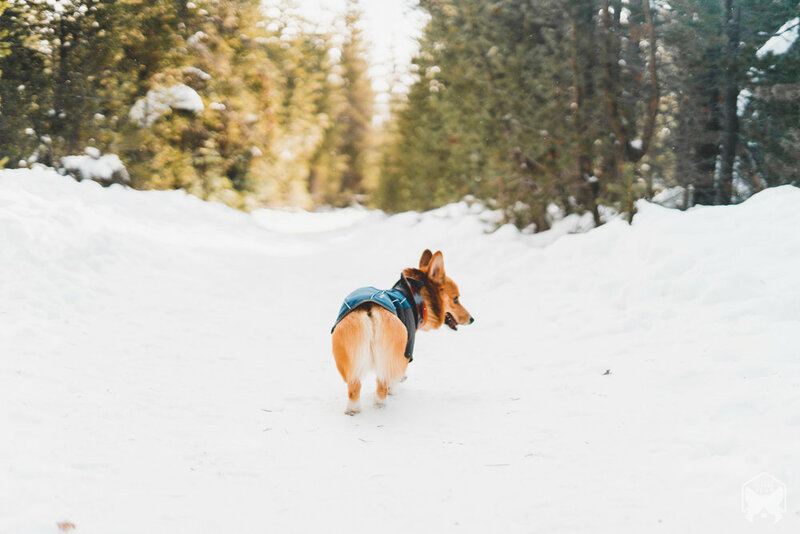 At Wanoga sno-park, there are two separate areas: one was for motorized snowmobiles and the other was non-motorized, in which there are plenty of opportunities for sledding tubing, biking, and dog-friendly hiking. The weather decided to bless us with snow flurries while we were walking around the trails of Wanoga. Even though we didn’t get to hike to see Dillon and Benham Falls, we still had fun and made up for lost time somewhere else. If you’re not one to hike in the snow but still want to have a leisure snow day, the sno-park is a great option. We went back into town earlier than expected and had a late lunch at Bad Wolf Bakery & Bistro. This is another dog-friendly restaurant in Bend that offers outdoor seatings with heaters, along with yummy food. My boyfriend and I weren’t too hungry so we shared the Spillway, which consisted of buttermilk biscuit, white cheddar cheese, fried chicken, scrambled eggs smothered in pork sausage gravy and crispy potatoes. It was exactly the right amount of food to fill us both up. For the rest of the day, we explored more of Downtown Bend and took our time with it. In the evening, we popped over to Drake Park to watch the sunset. To my surprise, this park was huge! Thirteen breathtaking acres huge, to be exact, that sits along the Deschutes River. And yes, this park is dog-friendly but do mind your steps since there are a lot of geese poops—just watch where your dog is sniffing. We watched the sky change color at the end of Mirror Pond as the sun started to set. To end our last evening in Bend, we ordered takeout from Noi Thai for dinner. Very basic, I know. They have outdoor seatings but there were no heaters available outside, and we just didn’t feel like eating in 20 degrees F weather. There’s nothing wrong with enjoying our Thai food within the comfort of our hotel. Our Bend trip came to a bittersweet end the following day as we got up at 5:00am and left the city on the dark, snowy road. This vacation away from home was an absolute gem, and I loved how Bend had just the right mixture of outdoors and indoor fun. 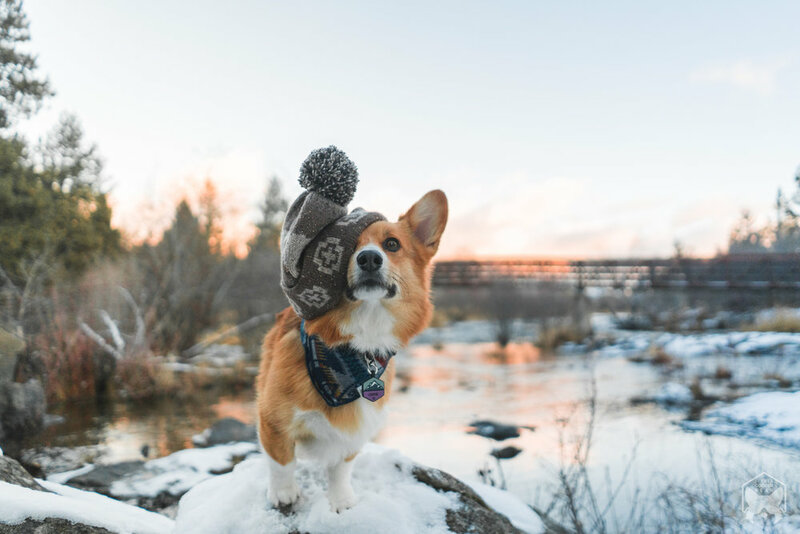 Nature was just a doorstep away, and the best thing about this place was how dog-friendly it is. The people were equally as friendly and just being in Central Oregon was humbling. Hope we see you again soon Bend!